This net of marbles is a set of marbles from Mega Marbles including 24 Target or 5/8" marbles and 1 Boulder or 1" marble. 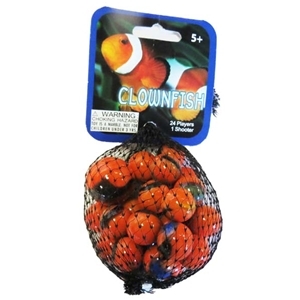 Clownfish are a primarily an opaque orange and black base. They are assorted in that some of them also have yellow in them, some have blue, some have aqua, and some have green. Warning! : Choking Hazard. This toy is a marble. Not for children under 5 years.